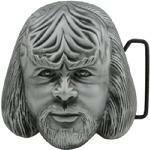 Item #STBB21-WORF Star Trek The Next Generation Worf 3D Belt Buckle $19.95 ea. In Stock This new Star Trek TNG Worf face belt buckle comes on a backer card with the Star Trek logo, belt is metal and is about 3 1/2" tall by 3 1/4" wide fits 1 1/2" belts, and is about 1/8" thick and 1 3/4" from front to back of buckle, very detailed, officially licensed by Paramount. Item #LMH-06341 Star Trek-The Next Generation TV Film Cells $24.95 ea. In Stock These 1996 Star Trek The Next Generation 35 mm. film cells are near mint, and still in the original boxes, each film cell is incased in Lucite plastic, one film cell is from the pilot episode "Encounter at Farpoint" and the other is on the bridge of the Enterprise D, each film cell is limited & numbered, each original film have been carefully selected and hand-cut from the master print taken from the original internegative. These film cells are one-of-a-kind, and will never be reproduced and sold to the public again. Each original film cell has been sealed with Scotchgaurd film protector. This protection gives a stracth resistant, static resistant, optically clear coating that actually improves the quality while extending the life of the film cell, officially licensed by Paramount. Item #STBB03 Classic Star Trek- Mr. Spock Metal Belt Buckle $24.95 (ONLY HAVE 1) This new Classic Star Trek-Mr. Spock belt buckle is near mint and made to fit a 1 1/2" belt, this full color belt has Spock as seen in the classic episode Amok Time doing the Vulcan hand salute in his standard uniform, this buckle is about 3 1/2" long by 2 1/4" wide & 1/8th." thick, trimmed in silver toned.